Stay at this delightful Alamosa hotel and experience the relaxation and tranquility of the majestic mountain view surrounding the San Luis Valley! 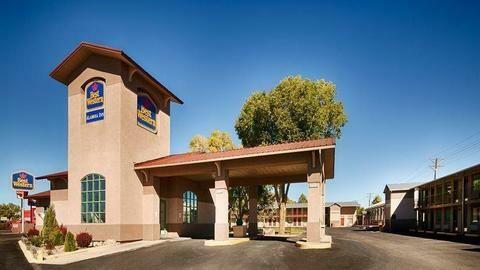 The Best Western Alamosa Inn is conveniently located in the beautiful San Luis Valley within walking distance to the Adams State University, Trinidad State Jr. College, and SLV Regional Medical Center. Hotel guests can enjoy local attractions such as the Colorado Gator Farm, Crane Festival, and Alamosa Roundup Rodeo. The hotel is accessible to the 'Los Caminos Antiguos' ancient roads, artesian spas, Cumbres & Toltec Scenic Historical Railroad, and outdoor recreation at the Great Sand Dunes National Park and Zapata Falls. Each spacious, charming guest room features all the amenities that make a difference while traveling including DSL high-speed Internet access and cable satellite television with HBO. Guests enjoy exceptional customer service including a complimentary deluxe continental breakfast each morning, an indoor swimming pool with Jacuzzi®, 24-hour front desk staff, and a beautifully landscaped park. The Best Western Alamosa Inn is near restaurants, pubs, and local boutique and designer gallery shopping for dining and entertainment. Golf and group packages can also be arranged for visitors. Make an online reservation today at the Best Western Alamosa Inn in Alamosa, Colorado!